You may have heard of Marie Kondo. She’s kind of a big deal. She has her own Netflix special, and she is an organizational phenom. Why am I talking about Marie Kondo, you ask? Well, she has some great tips on how to unclutter your life and a big part of our lives are the people with whom we love. The people we pick are not always right for us. We pick the wrong guys or stay in unhealthy friendships for fear that we’re going to be alone. Does this sound like you? I label these individuals the rescuers. They will do anything to feel needed so that if they are needed, then they’ll never be alone. Right? For example, If I’m going to do things for you, then you’re going to grow dependent on me, and then we’ll be in this sort of enmeshed dance. If we are going to remove individuals that do not bring us joy, just like Marie Kondo says, “get rid of all the things that do not currently bring you joy.” If we’re removing things, people, from our life, we are going to remove the critical people, the people that are harmful, people that humiliate us on a regular basis and really take away our joy. One way to do this is to stop being the rescuer. Simple. Right?! The mental script sounds something like, “Let me help you” and “The harder I work at helping you, the more you’re going to need me, the more I’m going to feel good about myself.” Rescuers have a martyr style while resentment festers underneath. The problem is, you are neglecting your own needs in a sense, feel unempowered, and often unable to identify your role in what Linda Graham calls the drama triangle, so what I suggest you do is, you label your relationships. Label the ones that are closest to you. What are you getting out of these relationships? Is it your brother-in-law that, every time he goes out of town, drops his keys in your mailbox so that it’s just expected that you are going to watch his animals for him while he’s gone? Is it your friend who wants to dump all of her emotional baggage on you wherever and whenever but, you know what, you might just be going through your own stuff right now, and you don’t know how to tell her that, and you don’t want to tell her, because she might take it the wrong way! Your assignment is, to make that mindmap/ list and start “uncluttering” your social network and relationships. Know that you are worth more than what you are able to give someone. You can get help with removing yourself from the drama triangle of persecutor, rescuer, victim. The first step is to contact me here. 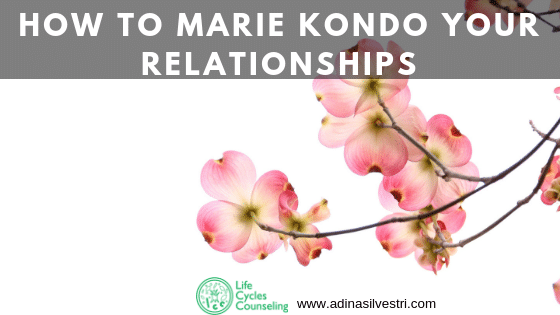 Go ahead and start Marie Kondo’ing your relationships! If you liked this blog, click to tweet! Click here for more tips and tricks on how to unclutter your relationships!